In the first of an occasional series, Sophie Jerram considers the history and current practice of commoning in New Zealand. New Zealand was the last English-speaking country to be settled in the world, and has become caught up in a narrative around scarcity that started in 19th Century England. In New Zealand, January and February represent summer holidays. Many people head to the coast for life at the country’s huge range of safe beaches. Others go ‘bush,’ to anywhere remote. Our family often retreat to a piece of hot dry farmland area in Otago called the Maniototo, (population just under 2000). After our year in a cool climate city, we love the distance from urban life and swimming in rivers and dams. We enjoy being surrounded by historic sheep and beef properties, many settled by Scottish & Irish farmers in the 1870s and still farmed by their descendants. Right at the foot of the land where we stay is an historic sheep dip. For the last ten years we’ve known this dip existed; even hungry sheep and cattle have fastidiously avoided the grass around the remnants of the structures, soaked no doubt in DDT and other pesticides. And this summer I discovered its written history. I’m personally excited about this piece of dry and infertile soil inadvertently poisoned in the name of animal health, because it’s evidence of some collective effort. The Wedderburn Sheep Dip Association it turns out, was formed in 1894 by 10 farmers and the neighbouring Tavern owner who donated the land. Farmers would no doubt slake their thirst next door following their group effort. “Each year, the committee would fix a charge for sheep dipped by each farmer and arrange a timetable for such dipping.” wrote local resident Pat Shea in his 1980s summary of Wedderburn life, ten years or so after the dip was last used. To put it in context, in 2016’s rural environment private property is king: tractors and tools are a point of personal pride for farmers and uncommonly shared. The state of community assets is in decline; the Wedderburn tennis courts and local hall are in bad repair. 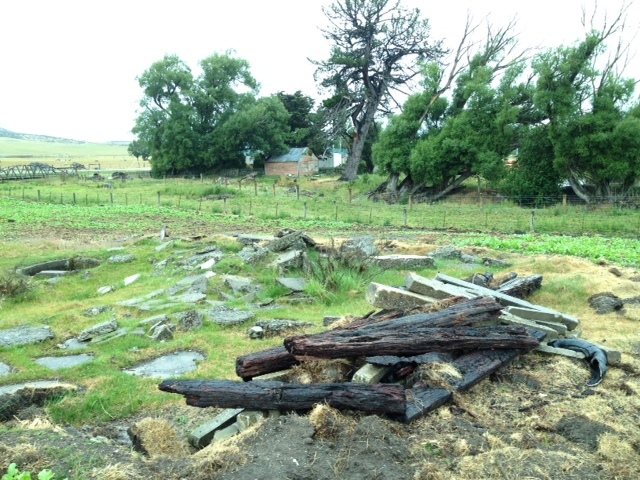 Neither is there any ‘right to roam’ on farmland in New Zealand. The current culture assumes an individualistic approach to land; until we found this booklet the assumption of our Wedderburn friends was that the dip had always ‘belonged’ to the Tavern. The Tavern as it happens, is still going strong; drinking beer has not yet gone out of fashion. Local resident Graham Duncan attributes the early Scottish farming immigration to John McKenzie, who, having been a victim of the clearances of the Highlands, came to New Zealand determined to assist less wealthy families. After being part of the Free Church of Scotland movement in Dunedin, he became an MP and passed the 1892 Land Act which made smaller land holding more possible. We’ll come back to him soon. The Scots are still strong in the city of Dunedin, but it was the English in the 19th Century who came to dominate the laws of the new colony. The English immigrants too consisted of a large portion of people who never afforded privately-owned land, and had been affected by the Enclosure movement. Following the industrial revolution and mechanisation of labour, many disaffected farm workers were creating such unrest that, according to historian Tony Simpson, the businessman Edward Gibbon Wakefield proposed to the British Government a scheme to remove them from England and decrease the British debt incurred after fighting in two wars of the American and French Revolution. They were to populate New Zealand. When these new white immigrants arrived in New Zealand they were sold a piece of land (often sight unseen) by the New Zealand company or subsequent owners. Whether that land had been officially bought or exchanged from its customary Maori tribe is a much bigger story I intend to address in subsequent writing. With the arrival of these migrants the creation of commons was given to the local municipalities; town parks and sports fields are relatively common. But in practice we became a nation of private land owners. Perhaps so excited about obtaining their own 1/4 acre section, our British forebears and our current population became very attached to individual house and land ownership. At one level we are spoiled for choice of commons. Our town belts and national parks (mostly managed through the Department of Conservation) are extensive and are our best ambling spaces. But because of their distance from city centres it is rare for them to be enjoyed on a daily basis. The culture of the 1970s-1990s I grew up in spent virtually no time in a town park or community hall. And a sense of regular urban shared space is lacking now for most city children who will often hang out in shopping malls for lack of things to do. We do however, spend a lot time at the shared beaches. 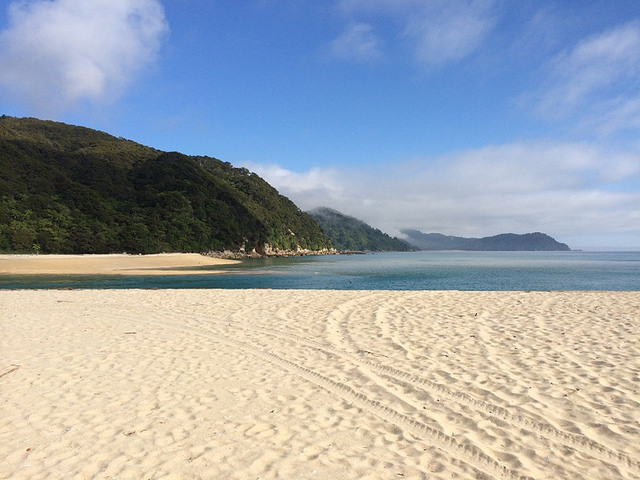 Our sense of right to these beaches is paramount to New Zealand identity. This brings us back to MP John Mackenzie, who through the same 1892 Land Act made the notion of the “Queen’s chain” more explicit than any other piece of legislation: he wanted all New Zealanders to be able to fish the rivers, lakes and coasts and to enjoy unrestricted access to forests and mountains. The common law understanding is that everyone is allowed access to the beaches a metre from the high tide mark. A challenge to this was made 2004-2010 during fierce debate around The Foreshore and Seabed and Act, which was eventually repealed and confused many citizens around customary rights for Maori. For now, the common space on our coastline is preserved. (Coastal erosion and rising sea levels may of course decrease much of this over time.) But just because we can stand on the foreshore of the beaches does not mean access is always easy.. You may need a boat to approach many bays and those with farmland or thick bush behind them often stay untouched. There are some small beaches that for historical reasons are not subject to the Queen’s Chain. And when we emerged from the rural hinterland last month we discovered a terrific new development in the commons. A piece of land adjunct in the middle of the Abel Tasman National Park (Northern South Island) is being sold on the open market. The Park was set up in 1940 and worked around several private properties. A major crowd funding campaign got underway to keep this piece of land in the public realm, started by two friends over Christmas dinner. My guess is that New Zealanders are both so repelled by the idea that this could become a millionaires’ mansion site and excited by a collective act of ownership, that it’s become a major good news story this summer. Now 39 000 individuals contributed $2m toward it. We’re yet to see how the seller has responded. It feels like a new chapter in commons-making in New Zealand. The consciousness has been re-lit on the beaches. The crowd-funded public bid on the piece of Awaroa coastline was accepted by the vendor on the 23rd of Feburary with the additional support of $350000 from the NZ government. This government top-up may yet prove to be an issue in terms of management. Currently we are surrounded in the media by feel-good, amusing commentary about the broader public consciousness that has been raised through this campaign and the every day ‘heroism’ of the campaigners. This clip shows the campaigners in laconic kiwi drawl as they anticipated the result of their bid, celebrating group effort in a dry kiwi manner. A dip is a place for animals to be bathed in pesticide to keep their wool and meat from disease. Twenty-first century management has rendered the dipping process redundant..
 House prices have doubled in the last ten years (as they have in many countries) and have driven home ownership out of reach of the average kiwi wage-earner.